Tue., March 26, 2019, 6 a.m. Grease six (6-ounce) ramekins with cooking oil spray or brush them lightly with oil. Place the saucepan over medium heat; cook, stirring frequently, until the milk is hot but not boiling, and the gelatin has dissolved. Stir in 1/4 cup of the sugar and the salt until they have dissolved. Remove from the heat then stir in the vanilla extract. Cool for 15 minutes at room temperature. Serve in the ramekins or run a knife or offset spatula around the edge of each panna cotta and invert onto individual plates. (As needed, dip the bottom of each ramekin in warm water to help release a panna cotta from its ramekin.) Spoon about a heaping tablespoon of the sauce over each portion. 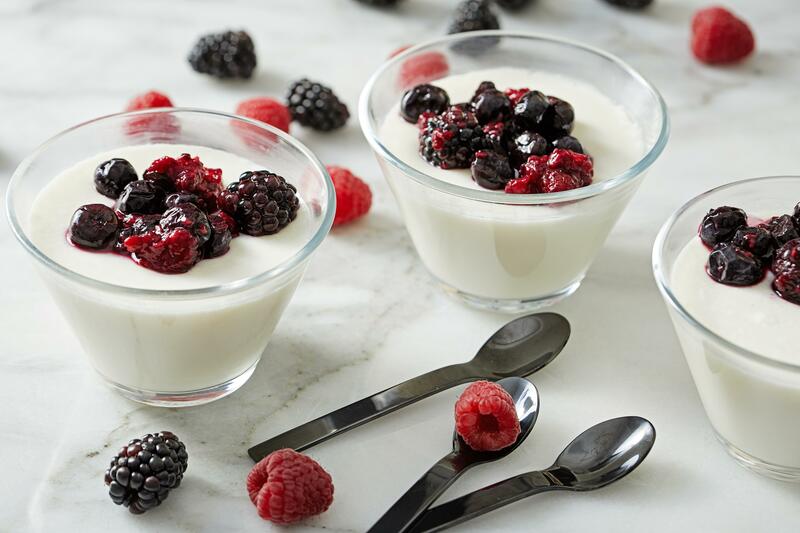 Note: Panna cotta will keep, refrigerated, for up to 3 days. If making more than 1 day ahead, loosely cover the tops of the panna cotta; and keep in mind the texture of the dessert will stiffen slightly over time. The berry sauce can be made up to 4 days ahead and stored in an airtight container. Bring it to room temperature or warm slightly before serving over the panna cotta. Published: March 26, 2019, 6 a.m.